At least five people remain critically ill after a nail bomb exploded in a central London pub, killing two and injuring more than 70. Surgeons were operating on a further four people early on Saturday morning and several more are still said to be seriously ill.
Forensic scientists and anti-terrorist squad officers spent the night combing the scene for clues. They are now trying to establish whether there were any CCTV cameras in the area that may have captured the bomber on film. The group laying claim to the Soho pub bombing is a neo-Nazi splinter organisation which takes its name from a Serbian paramiltary death squad. Police said a short garbled call attributing the attack to the “White Wolves” had been telephoned into the BBC. The same group has already claimed it carried out the bombings in Brixton and Brick Lane, both areas of London with large ethnic minorities. Police believe the same people are responsible for all three attacks. In the last few weeks the White Wolves have sent a series of racist threats to prominent members of the UK’s ethnic minorities and anti-racist campaigners. In recent weeks up to 25 people have contacted the organisation after receiving identical stencilled death threats from the White Wolves. Police have taken many of the letters, which are always stencilled in black ink to disguise the identity of the writer, away for DNA testing. 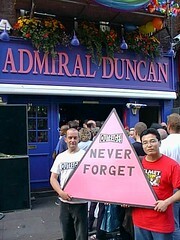 “Ever since the first bombing was attributed to right-wing extremists, many gay activists have feared the homosexual community would be the next group targeted. 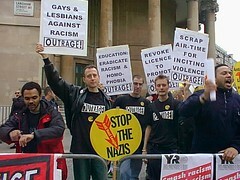 Given that neo-Nazi terrorists were being blamed for the first two bombings, there was a shocking police delay until only two days before the blast in warning the gay and Jewish communities that they were likely to be next. The police decision to focus solely on a racist angle was a big mistake – it must have lulled many gays into a false sense of security. This bombing shatters the complacent assumption that gay people can take their freedom for granted and shows we are still vulnerable to violent attacks. I have had several calls from ordinary gay people and they are stunned. 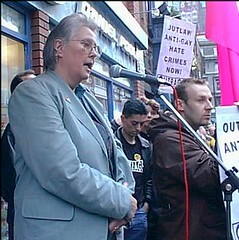 The Old Compton Street area has long been regarded as a safe, relaxing area for lesbians and gays. Update: Saturday, 1st May, 23:50 a.m.
On Saturday, 1st May a number of L/G/B/T community groups including OutRage!, Stonewall, and London Lesbian & Gay Switchboard, joined the protest march called by Lambeth UNISON, and backed by the Anti-Nazi League, the National Assembly Against Racism, the National Black Alliance, and the Movement for Justice, which was set up in the aftermath of the bungled police inquiry into the murder of Stephen Lawrence. Two people were killed and more than 80 injured in a nail bomb blast at a gay pub in Soho, central London. A third died in hospital 24 hours later. Police said the bomb had been placed next to the bar in the Admiral Duncan in Old Compton Street, exploding at around 1835 BST. One witness described the scene as “absolute carnage”, with several people blown out of the pub into the street. No warning was given. 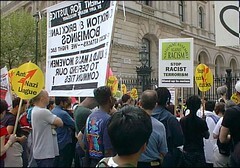 It was the third nail bomb attack in London in the past fortnight. Police are linking the explosions and said all the devices were of the same size and type. 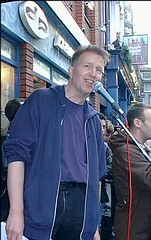 A far-right splinter group, the White Wolves, later telephoned a BBC newsroom and claimed it was responsible for the Soho explosion. 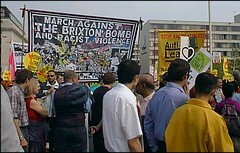 The previous blasts, in Brixton and Brick Lane, appeared to target ethnic communities, and the White Wolves were one of several extreme right-wing groups that claimed they were behind those attacks. Apart from the two dead, three hospitals in the centre of London reported 13 seriously hurt – including two who had lost limbs – and 68 with minor injuries. Twenty one ambulances were called up, and the injured taken to University College, Guy’s and St Thomas’s Hospitals. Ken Murphy, a motorcyle paramedic with the London Ambulance Service, was first on the scene. He said there were numerous casualties, including two with “traumatic amputation of limbs”. Friends or relatives worried about the injured can telephone Scotland Yard’s casualty bureau on 020-78.34.77.77: but the line is very overloaded, be patient. Injured at several hospitals and others have checked into their nearest hospital to home, hence confusion with numbers and delays in information. Casualty centre will log your details and data base will match casualty to you once located. You will be called as soon as this happens. Particular concern that some injured or dead may be foreign tourists and this will add to identification problems. Anyone with information should contact the police, in confidence, on the anti-terrorist branch hotline on 0800-78.93.21. If any witness particularly wishes to speak to a lesbian/gay police officer, members of the Lesbian and Gay Police Association will be available around the clock at the Police Mobile Command vehicle located in Soho Square. The latest bomb in London is the third in two weeks: the first to kill, and the first indoors. 17 April — Just before 1730 BST a nail bomb exploded in Brixton, injuring 39 people, some seriously. Police say there was no warning. Victims, including two children and a police officer, were wounded by flying shrapnel and shards of glass. Some were left with nails embedded in their bodies. A 23-month-old boy with had 2cm of a nail removed from his brain by surgeons at Great Ormond Street Hospital in a one-and-a-half-hour operation. 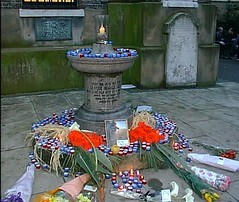 24 April — Police staged a reconstruction of the Brixton attack to encourage more witnesses to come forward. Soon afterwards, shortly before 1800 BST, six people were injured and buildings damaged by a second nail bomb, which exploded near Brick Lane, Shoreditch, in east London, the centre of the Bangladeshi community. A motorist who discovered the device put it in the boot of his car and was attempting to drive to a police station when it exploded. 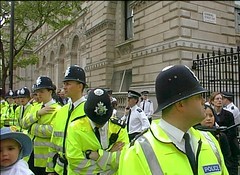 Police linked the incidents and say they are treating them as racist attacks. Two hours after the attack, a 999 call was made by someone purporting to be from Combat 18 claiming to be behind the bomb. UK Home Secretary Jack Straw has led the condemnation of the bomb attack in Soho: “This is a terrible outrage committed by people with no humanity. I know that the police are devoting huge efforts to find the perpetrators. Our hearts go out to those injured, their families and friends. This awful crime reinforces the need for all of us to be vigilant. The Queen sent a message of sympathy to the victims; and a belated denunciation of bombing was obtained from the Archbishop of Canterbury. 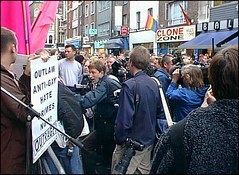 Security has also been stepped up in Brighton, and Manchester’s Canal Street, which are both popular gay areas. Gay businesses and pubs are asked to check their CCTV systems are fully functional. — Are date and time set to summer time? Is new tape in? Is lens wiped clean? 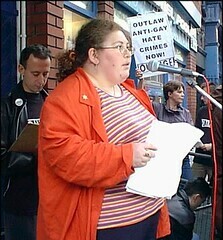 Vigilance in gay areas is advised, and people are warned to look out for suspicious people or unattended bags. Do not be embarrassed about false alarms – the LGBT community has every right to take extra precautions given the stated objectives of Combat 18. Richard Allan MP (Liberal Democrat, Sheffield Hallam) last Friday (8th May) tabled an OutRage!-sponsored amendment to crack down on the perpetrators of homophobic violence. The amendment to the Crime & Disorder Bill is expected to be debated this week by the Standing Committee of 24 MP’s that is currently scrutinising the Bill. The new Equality Alliance, representing over 160 organisations campaigning for lesbian and gay human rights, has written to all 24 members of the Standing Committee, urging them to back the amendment. It has also written to the Home Secretary, Jack Straw, and four other Home Office Ministers. OutRage! believes it can win substantial support for the amendment among backbench Labour, Liberal Democrat and Scottish Nationalist MP’s. “We are seeking support from MP’s of all parties and hope to mobilise enough support from backbenchers to get this amendment carried”, said Peter Tatchell of OutRage! “We urge people to write to their MP’s requesting them to support this amendment. The OutRage! amendment extends the Bill’s new penalties for racist attacks to crimes of violence against lesbians and gay men, providing tougher sentences for prejudice-motivated offences. “A survey by Stonewall published in 1996 showed that 34% of gay men and 24% of lesbians had experienced violence within the past five years because of their sexuality”, said John Hunt of OutRage!. “One in four of those attacked had to seek medical attention; and 79% suffered stress or fear following the attack. “Other research, including a Home Office report, has found similar or even higher figures. Extrapolating these results would suggest that throughout the U.K. over a million gay people have suffered homophobic violence. 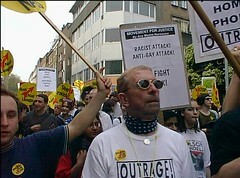 Homophobic hate crimes wreck lives. 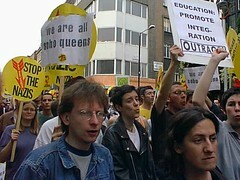 Lesbian and gay people deserve the same protection as ethnic minorities. All perpetrators of crimes of prejudice should be punished with equal severity”, said Hunt.